Excimer laser coronary atherectomy (ELCA) has been used for coronary intervention for more than 20 years for the treatment of obstructed coronary arteries. This technology is designed to ablate the obstructive atherothrombotic plaque. The initial data have failed to show better angiographic, procedural, or clinical outcome results when compared to balloon angioplasty or stenting. 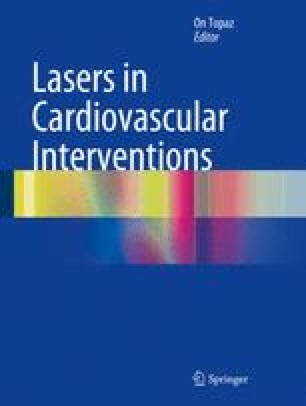 Advances in delivery systems for laser energy using the xenon-chlorine pulsed laser catheter deliver higher energy density with lower heat production and have led to better results in terms of efficacy and safety with low complication rate. The Spectranetics CVX-300® (Spectranetics Corporation, Colorado Springs, CO) excimer laser catheter system has been used for the treatment of several coronary indications. This chapter will focus on complex coronary lesions, including balloon-resistant lesions, chronic total occlusions, in-stent restenosis (ISR), and underexpanded stents in calcified lesions. ELCA is used for thrombus containing lesions in acute myocardial infarction and degenerated saphenous vein graft lesions (not discussed in this chapter).